Highly pigmented, ultra soft, lightfast, low dust and erasable PanPastels mix, layer and apply like paint. 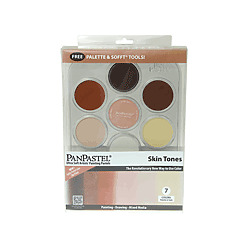 They come packed in pans so artists can easily lift, blend and apply pastel color. The unique packaging protects the colors, keeping them separate and clean, and interlocks securely together for storage and transport. They are compatible with traditional pastel sticks, pastel surfaces and conventional fixatives. They allow for maximum control and can be used for intense strokes or delicate marks.